These are two programs of Massachusetts caller Corky Calkins, one from 1965 and the other from 1967. They were noted by Connecticut caller Ralph Sweet who for decades carried a small notebook with him to dances and recorded the programs and any unusual figures used by the caller. The 1967 program took place in Sweet's own Power Mill Barn in Hazzardville, CT, just over the Massachusetts line. 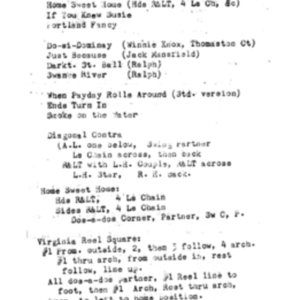 These listings provide a glimpse into a program that was composed mostly of the traditional singing calls that characterized "Eastern" squares for many years. 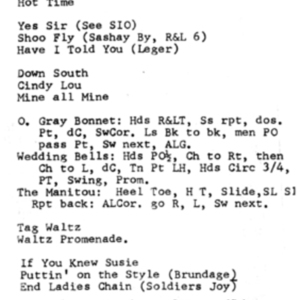 Ralph's note to the 1965 program indicates the growing popularity of modern square dancing as do the presence of such new calls as Catch All Eight and material from Sets in Order. Corky Calkins, “Corky Calkins - two programs,” Square Dance History Project, accessed April 18, 2019, http://squaredancehistory.org/items/show/1425.